The popularity of robotically assisted technologies has resulted in the continuing development of the BioPROTECT® Series of walk-in and reach-in biological safety enclosures. Through the innovative use of robotic technology for drug discovery, high-throughput screening, and high-volume sample management in a contained environment, Baker offers the highest standard of air containment in the laboratory. BioPROTECT® Equipment Containment Enclosures Class II Style, for Type A2 Applications Walk-in clean air and containment enclosures are available in two sizes. With a flexible modular design, the BioPROTECT® III and BioPROTECT® Jr. are Class II style clean air and biocontainment enclosures designed for high-volume robotic and automated equipment applications. 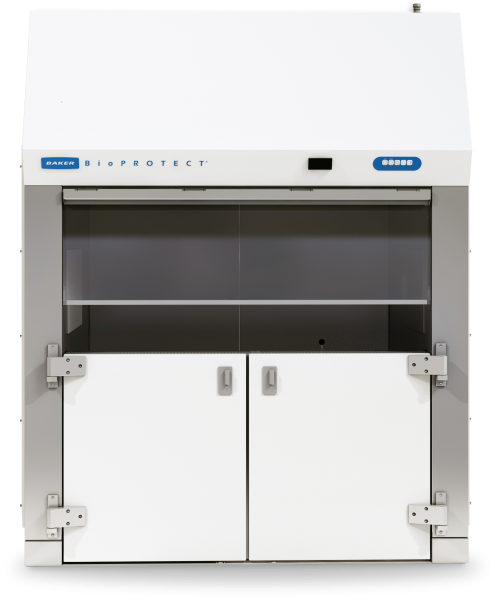 The BioPROTECT® air containment unit accommodates high-throughput robotic systems (including ancillary devices), ultra-centrifuges, flow cytometers, aerosol generators and other large laboratory equipment. Both models are ideal for high-throughput screening, combinatorial chemistry, immunology, tissue culture, clinical research, drug discovery, molecular biology, and quality control assays. BioPROTECT® enclosures are designed for aseptic product preparation and biological investigation involving agents of low to moderate risk. The BioPROTECT® III may be exhausted back into the laboratory or connected to an in-house exhaust system. The BioPROTECT® III model offers clean air and biocontainment while allowing total access to the spacious 164-cubic foot interior work area (nominal) with combination double doors. The BioPROTECT® III Jr. has a single door access with a 78-cubic foot interior volume. Class II Style Walk-In Clean Air and Containment Enclosures.